Over the years I became very dissatisfied with the knowledge I was getting in Germany. At that time, it was becoming increasing popular to investigate yoga and Indian culture. For me and my brother, Janardhana, Indian music was becoming popular as an alternative to western music. This new revelation led us to search for a guru. In 1982, I migrated to New Zealand where I met some very interesting people. One of those people kept telling me that I should read the book by a Hindu Yogi, Paramahamsa Yogananda, entitled “Autobiography of a Yogi”. Without looking at it thoroughly I thought to myself that this were all stories and make believe, but with the insistence of my new found friends, I began to read the book. I became very interested in its contents, and my mind became bothered and I wondered sincerely about whether there is a guru to guide me and how to find him. My life in New Zealand became very rocky, and things that I thought were meant to last, rapidly fell apart. First and foremost, I was away from my family in Germany and with me living on the other side of the planet it felt as if we were worlds apart. During this time my brother had been to India and met his guru, Sri Ganapati Sachchidananda Swamiji. In 1988, he was about to visit the ashram again and suggested to meet in India as it is the midpoint between New Zealand and Germany. In this way, I arrived in Mysore, ahead of the Shivarathri celebrations and due to the availability of flights two weeks earlier than my brother. This was my first trip to India, with so many new impressions and challenges. On my arrival in Mysore I became very excited as I made my way to the ashram. On approaching the main gate I noticed everyone was smiling and welcoming me. They were saying “Jaya Guru Datta Janardhana!” Apparently, they mistook me for my brother. This welcome was very encouraging and heartwarming and I felt as if I belonged to this ashram already for a long time. There is a saying “you can’t find a guru, you can’t even go to a guru; it is the guru who finds you and it is he who comes to you”. This was confirmed by the fact, that when I arrived at the ashram, Sri Swamiji was not there as He was on a tour through Andhra Pradesh. However, the ashramites were ever so kind and made me feel welcomed. When I told them that I felt that this ashram felt like my true home, they said that this was a good sign for Sri Swamiji to accept me even though at times He can be very strict and would send people away from the ashram. I was very concerned about this but at the same time I prayed that He would not reject me. Meanwhile my brother had arrived from Germany and took me up the Chamundi Hill. Finally, one evening, the ashramites were expecting the return of the Guru and they were very busy cleaning the entire ashram compounds. Someone told me to do some seva and to go to the dining hall and clean the pictures there. After I finished with my task, I was standing in anticipation to the arrival of the Guru, along with the other devotees from abroad, outside the prayer hall as instructed by Radhakrishna. However, a telephone message came announcing that Sri Swamiji would be delayed for another day. Allthough the ashramites were disappointed, I felt a secret relief, because somehow I wanted to see Him and not see Him at the same time, fearing that He would not permit me to stay in His ashram that had become so precious to me. As the delay of the Guru’s return went on for the following two days, I began to relax thinking “Oh maybe He would not come today also, so without being nervous I can enjoy another day in this ashram”, which felt more and more like my true home. Then suddenly that evening there was a big commotion as people started to flock along the dirt road entrance, I saw this German made car coming towards me. I saw onlyHis hand waving out from the open window at the people. The car stopped outside the gate close to where I was standing and I saw Sri Swamiji getting out and walking towards us. I looked at His physical frame thinking that He is rather small. I had always imagined Him as much taller. But lo and behold as He approached it appeared to me as if His form was growing taller and taller with each step He came closer until He reached a supernatural size like a huge stature of the Trinidad Hanuman, and I fell in a swoon. When I came to, I found myself sitting with all the other people from abroad on the ground in a semi-circle at Sri Swamiji’s Feet who was sitting on a chair. Looking at His face, I saw all the likable features that I have ever seen in the faces of different men throughout my life: the color of His skin; the long, black beard, the lush lips, the dark, sparkling eyes, the whiteness of His teeth, the shape of His nose and the long, black, shiny hair. It felt, as pieces of a jigsaw puzzle effortlessly formed a picture that I knew, but had forgotten and I felt that indeed that I had known Him for a very, very long time. As if mesmerized, I couldn’t take my eyes away from Him while a warm sensation of love for Him overwhelmed me. Prasad, then a young devotee and secretary of His Holiness, was introducing everyone to Sri Swamiji who silently smiled at each and everyone. Then Sri Swamiji pointed at me and asked “And who is this?” Prasad said, “He is a newcomer, the brother of Janardhana”(who was sitting right next to me). Sri Swamiji moved His head in a typical Indian way and smiled at me, like only He can smile, before He got up and proceeded to His room. Before the small crowd, who were all in a state of mild ecstasy could disassemble; Prassad returned to tell us, that Sri Swamiji was calling each of us for a personal interview. We all rushed back to the old angel’s hall where we were staying and I had to queue up to take a bath as instructed. Then we gathered, sitting silently waiting outside the interview room. Along with my brother, I was the last one to have Sri Swamiji’s darshan. He looked very radiant and majestic to me, just like a king and the entire room was charged with His incredible energy. Entering the room we both fell flat at His feet. I had intended to ask a whole catalogue of questions regarding my challenging life circumstances, but when I came so close in front of Sri Swamiji I felt an incredible heat rushing through my body and my mind got completely blank. I had only one desire: to make myself as flat as a thin sheet of paper on the ground at His feet. Only then I was able to speak again and could ask, if He would allow me to be His disciple. I didn’t even know the difference between a devotee and a disciple then. But He only smiled at me lovingly and said “Yes”. Then I asked if He would initiate me with a new name. Again He said “yes”, asked for my date of birth and said: “Chaitanya”. The only other thing left that I could say was: “Please come to New Zealand one day”. “Definitely Swamiji will come” He replied. After this, I had the urge to get out of that room as I was overwhelmed with His divine radiance. There was nothing more to say, I felt like intoxicated and shy at the same time, almost unable to bear His strong energy and mesmerizing smile. Overcome by a strong feeling of respect for Him, I did not dare to waste any of His precious time. Later, when I got out of this state; a state of ecstasy as I have never felt before, I realized that I forgot to ask all the questions which were part of the reason that I had come to India in search of the guidance of a guru. As I could not approached Him again, because the preparation for Shivarathri had become very intense, I wrote a desperate letter to Him of my immediate problems and gave it to one of the ashram boys. Later, another of the ashram boys came and asked “you wrote a letter to Sri Swamiji?” I said “yes”. He smiled and left without another word. Shivaratri day had arrived. Sri Swamiji was performing Agni puja by entering into the homa kunda. I cannot describe what took place on seeing Sri Appaji climbing into the fire, but the atmosphere around the devotees that were around Him, was very tensed. After the program, I left as a completly different person. One day, after Shivaratri a lady devote from Germany, bought a large wooden Ganapati with five heads in the city. She wanted Sri Appaji to bless it before she was going to send it to Germany. She told us, that Sri Swamiji had requested for all of us to participate and so we waited for His arrival in the old Dattatreya temple. When we saw His Holiness, He appeared to be in a totally different mood. His face looked very strict and He was talking sternly to us. He said, “you people talk about your intuition, you talk of your inner voice, don’t listen to it, it’s only your ego in disguise. You neither know what intuition is, nor do you know what the inner voice is, this is your entire ego alone, your desires! Just face your problems and finish the game”. As He was speaking like this, my mind was shrinking for I was convinced He was referring to all my questions in my letter in which I have used exactly such phrases like “my inner voice is telling me…” and “my intuition says…”. I realized that I must have made a complete fool of myself, that I was absolutely wrong as how my worldly problems would be solved and was convinced that He has spoken to me alone. After Sri Smamiji had blessed the idol, He got up and left immediately without another word. When I walked out of the room I felt bashed and noticed that all the other devotees had a similar solemn look. “What He said was exclusively meant for me” I said to them. But to my great surprise each of them insisted that all His remarks were addressed to them alone. In 1989, I visited the ashram again for Sri Swamiji’s birthday celebration. After the celebration, He left for Germany and I also went to Germany to see my parents. As it turned out I was blessed to participate in the entire tour of Sri Swamiji in Germany. All the same, the questions about my worldly life, my future, profession, and relationships were still pressing in my mind. Because of this, I couldn’t bear to be physically close to Sri Swamiji, but instead felt an incredible urge to envelop myself in seva. I would always go the next town where His concerts were scheduled, handed out and flyers and put up posters in shops and other appropriate places announcing His arrival. I also read the road map for the driver of the vehicle carrying the musical instruments and puja materials. As this vehicle was very slow I guided the driver away from the highways along smaller country roads. Although many devotees would be traveling to these towns in speedy cars via the motorway, we happened to be always the first ones to reach the next venue and able to set up just before Sri Swamiji’s arrival. Because of this the problems in my mind were being put on hold. Just before the last concert of the tour in the south of Germany in Heidelberg, I help with setting up of the stage and suddenly became very hungry. I was told to go to an Indian restaurant where food had been prepared especially for all the helpers and so I proceeded there. On the way I continued with the distribution of posters and flyers for the concert in the evening. When I finally arrived at the restaurant it was already closed. With an empty stomach I returned to the music hall and had just sufficient time left to take a shower and to put on fresh clothes before the program started. During the concert, I sat about twenty-five meters away from Sri Swamiji, got completely enshrouded in His enchanting music and I fell into a kind of meditative state. Concentrating completely on Sri Swamiji I was inwardly talking to Him: “Appaji, I don’t want any wants anymore. I surrender my will at your Feet. Whatever it may be, it should be Your will, not mine; not I, but You will decide”. At that instant, I felt a never-known sensation of happiness, of being at perfect peace with myself. Something seemed to touch me ever so gently on my forehead at the point of the third eye just as if a butterfly had landed there. Intoxicated by this blissful experience, I opened my eyes and realized that Sri Swamiji was looking straight at me while He was playing the music. I felt a rush of energy flowing through me; an energy that was capable of achieving anything, no matter how difficult the task. As soon as the concert was over, Prasadi came rushing towards me and said that Sri Swamiji wanted me to drive the vehicle with all the instruments and pooja items to the next destination, which was about three hundred kilometers away, so that I would have to start immediately driving throughout the night to arrive there on time. Without hesitation I said, “No problem.” I told the owner and driver of the vehicle, who was just getting ready to go to sleep, about this, but he felt uneasy letting me drive his huge van. So we agreed that he would drive, as long as I would read the map and made sure to keep him awake. To date, this was the most secretive silent communication with Sri Appaji and it cannot be compared with any level of meditation. Back in 1988 when I met Sri Swamiji, I was very naïve as I was innocent. I had no understanding about anything regarding the proper behavior towards the guru. I had heard that Sri Swamiji likes places of pure nature and I knew such magic spots in New Zealand. Only because of this, I had been asking Him to come to New Zealand. Back then, Sri Swamiji had said: “Definitely Sri Swamiji would come”. Little did I know then that this was going to happen twelve years later! In late 1999, Sri Swamiji declared that He wanted to perform a special Surya Homa to greet the new millennium on the land with is nearest to the international dateline, the land on which the sunrise of January 1st, 2000 would hit first. Until then New Zealand was that country, so I informed Mysore Ashram and started planning for that event. Meanwhile, the Kingdom of Tonga put their clock forward by one hour so that Tonga would be the first country on earth to see the sunrise of the new millennium. I became very distressed, but then I was informed that Sri Swamiji would secretly proceed to New Zealand with His entourage only, after visiting the Kingdom of Tonga. 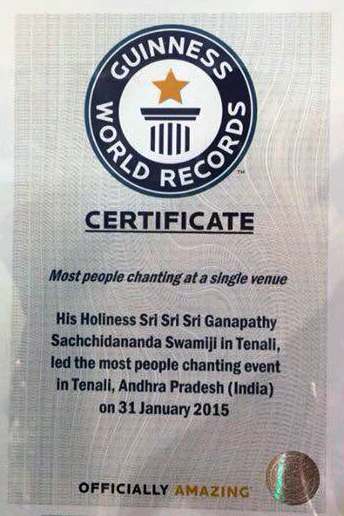 So it happened that Sri Swamiji kept His word to come to New Zealand. In my little mind, I wanted Sri Swamiji and His entourage to stay at the same venue. I found a beautiful house in the mountains that would accommodate everyone. However, as it happened, a considerable number of devotees followed Sri Swamiji to New Zealand. My brother had been granted permission to come straight from Germany to help with the preparations and we hired a nine-seater especially for Sri Swamiji and His pariwara. I was driving my vintage Vauxhall Victor station wagon to the airport to collect the luggage ahead of my brother, who was driving the van. Just as we approached the airport at a round-about, a car in front of me suddenly changed the lane without indication so that my car accidentally hit it. I quickly talked to the driver and we exchanged phone numbers as there was no time to negotiate for damages. There was a small dent on the left side in the front and the indicator lens was broken. Knowing never to let the Guru wait we rushed to the airport by breaking all traffic rules and finally arrived at the pick up waiting area. Like most New Zealanders the airport staff was very forgiving. After criticizing our inappropriate behavior, they told us that if we had informed them before hand, they would have made all arrangements for us. Then they told us to rush inside while they were guarding the vehicles. When we reached the terminal Sri Swamiji was already waiting along with His followers. He saw us and embraced us just like Rama embraced Hanuman, an act which He rarely does. Before we could take Him to His proposed accommodation, we had to organize taxis for all His followers who were determined to follow Him wherever He goes. It is said that Sri Swamiji controls even the weather as He must have done in this instance because, although it was early summer in New Zealand, the weather was rainy, foggy, and a cold wind was blowing, mercilessly. Because of this, the owner of the house had lit the fire in a wood burner which had a fireproof window, so that the fire was visible. Sri Swamiji came into the house and made Himself comfortable in an armchair right beside the fireplace, and joked saying that ths fire place was a modern homakunda. Then He said: “And Now let’s of us have nice cups of coffee!” which is a typical custom of coming together in New Zealand. As is the custom of India’s holy men, normally wouldn’t eat or drink in public. However, Sri Swamiji was about to drink His cup of coffee right in front of us and in awe, Kussumaka instructed: “Now everyone, close your eyes!” But Sri Swamiji said to her cheerfully: “No, no, no, you just close your mouth!” Later I understood that if one looks innocently and without desires at Sri Swamiji while He eats or drinks, it will not have any negative effects on Him. However, generally He does not allow anyone to look intentionally at Him in such situations. After the coffee, Swami Manasa Datta, Purvasharam Radhakrishna, took me aside and said very strongly and sincerely: “Chaitanya, Sri Swamiji has come here only for you and your daughter.” This confused me. Little did I know how true this statement was which I was able to understand only in the near future. Sri Swamiji blessed the owner of the house saying:”Where I stay once I will always be!” He explained that He would not be able to stay, as there wasn’t enough room for all the devotees who had followed Him and that He would take lodging in a hotel in the city so that His devotees could be near to Him. The free standing house was situated right on top of a mountain overlooking the harbor. As the weather was still very rough my brother tried to back up the van on the steep and slippery driveway. However, the wheels were spinning and Sri Swamiji told him to stop and wait there, as He walked towards the vehicle with tiny steps. Worried that His footwear was unsuitable for this terrain I hastily rushed to His side and offered to Him my left arm in support. But to my utter amazement He did not accept my offer, but instead stopped and grabbed my arm very firmly. He looked at me with very serious concerned eyes for a long while, touched my arm up and down as if He was examining it and said warningly: “Be careful!” For the remaining distance He continued to hold my arm as if to support me until we reached the vehicle. In total thirteen people wanted to go whale watching including Sri Swamiji. To secure the tickets, I booked the boat tour over the phone for a total of thirteen participants. The officer said: “It is our policy that if twelve tickets are purchased you will receive an additional one free of charge. Please tell us the name of the lucky recipient. We will be delighted to hand out the ticket to him personally”. Overjoyed I said: “The name is Sri Ganapati Sachchidananda Swamiji!” In this way Sri Swamiji’s sankalpa came true as nobody could pay for his ticket, which was gifted to Him personally by the tour operators on our arrival, which Appaji accepted with a knowing smile. During the boat ride most of the Indian passengers got sea sick, but Sri Swamiji remained unaffected. He was very alert and silent and appeared to be concentrating on something. He stood firmly on the rocking boat with His gaze fixed on the blue waves and I thought to myself: “Although He doesn’t steer the boat, He is the captain here”. As no whales were in sight, the skipper was trying to explain that sometimes this does happen and apologized that he can give no guarantees for any whale to surface. By then we had been out on the sea for more than half of of the tour already and the skipper announced that unfortunately we were obliged to return back to the shore. Obviously everyone was disappointed except for Sri Swamiji who continued with His concentration, silent gazing at the blue water. Then all of sudden, a large school of at least twelve whales surfaced, swimming majestically with a crowd of dolphins jumping up and down amongst them. The whales stayed for a very long time at an almost touchable distance from the boat blowing fountains up high in the air. Everyone got very excited and rushing to the railing with their cameras, the Indian devotees had forgotten about their sea sickness. Unaffected by this commotion, Sri Swamiji stood still in anticipation with His typical smile of supremacy. The skipper shut down the engine and we waited until the last whale had dive back to the depth of the ocean, gracefully displaying his huge fin. On the way back to shore the dolphins followed our boat while the skipper told us, that this type of whales normally feed on dolphins but miraculously they all had been swimming together peacefully this time which even he had never seen before. The following day, Sri Swamiji wanted to visit the botanical gardens in Christchurch. With His typical pace, He went ahead of us straight to the bonsai section as though He had been to this place many times before and looked at the small trees with great admiration. “Swamiji likes bonsai trees very much”, he said. Another German devotee, Joe Krishna, asked boldly: “Swamiji, why do you like bonsai so much?” Sri Swamiji calmly replied “because Swamiji Himself is like a bonsai”. Joe, who obviously thought the Guru was joking, laughed and stated: “No Swamiji, You are the biggest and the tallest tree in entire universe.” But Swamiji was not at all joking and insisted: “No, Swamiji is a bonsai, because I have to make myself so very small, otherwise you would not be able to see me. But this is the limit. I cannot make myself any smaller than this”. Little did we know then that Sri Swamiji would establish the bonsai gardens in Mysore several years later, which by now are among the greatest and most probably the most beautiful ones in India. After the New Zealand program, Sri Swamiji left for Mysore. Two days later, in the evening, I went back to the house where Sri Swamiji had visited initially to have coffee. My Vauxhall was an old yet reliable collectible car from the early sixties. I had gone to the house to remove the items that I had brought for Sri Swamiji’s visit. As already mentioned, the house was way on top of the mountain with a long and very steep curving driveway. After putting the items in the car, I tried starting the car, but although there was battery power, the ignition was dead. When I had asked for help in moving the items to the car, the people of the house flatly refused so I was already fuming with anger and did not even think to ask them for help with the car. Instead I was determined to jump start the car. In order to do this, I first had to push it backwards into a small turning bay. Then I tried pushing the car downhill, which was very difficult, as the car had to be steered at the same time to prevent it from crashing into the retaining wall on the opposite side. Again and again I had to push the heavy car backwards and forward to get it into motion. After countless attempts, it finally started to roll downhill, but it picked up speed so quickly that I had to run to jump into it and slammed the door. By then the car was rolling at such a rapid speed that I could neither reach the brakes nor had I sufficient time to control the steering wheel. Instead of following the path of the driveway the car went straight over the edge of the precipice and down a rocky cliff. Everything happened so incredible fast and unexpected that I could not even think of the mantras that Sri Swamiji had given to us for our protection. All I knew was that this must be the end to my tragic existence and my mind went blank. The next thing I remember was being no longer inside the car, but it was rolling down the cliff like a log, until my body got caught by a sturdy brush that had been growing there. Lying there I could hear the thumping of the car until it crashed noisily onto another driveway some thirty meters below and got stuck there. Shaking, I scrambled back up the cliff. Miraculously, I had only a few scratches on my leg, my clothes were torn, and one of my shoes was missing. People from the house came running, thinking that I was surely dead. In my mind, I did not want to see them nor did I want to stay there. I only had a longing to walk straight to my house where just two days ago Sri Swamiji had allowed me to do Pada puja and where He had been performing the first Ganapati Homa of the millennium, after which he had tied the raksha on my wrist. Much later, when my brother showed the slides of this homa to the devotees in Germany, they discovered that during this Homa the flames of Agni formed a perfect image of the Omkara at the instance of Appaji offering the poornahuti. However, before I could leave the scene of the most horrific experience of my life, I had to walk down the driveway then take a left turn to reach the other driveway where the car had crashed onto its left front with the rear sticking up in the air. To my utter amazement I observed, that all the doors were shut and all windows wound up. How on earth was it possible that I had been catapulted out of the car as it shot over the edge of the cliff? I was anxious to open the driver’s door as my dog was still inside and most probably dead. With some effort I managed to open it and to my great joy the dog jumped out happy and very alive as if nothing had happened at all. Inside the car everything was upside down and disheveled. Previously I had converted the ashtray on top of the dashboard into a little altar with Sri Swamiji’s photo and a small Ganapati idol. Incidentally, only these two items were still in their place and completely untouched. Carefully I removed them to take them with me, and walked back to my house along with the dog. The following morning I went back to look at the scene in broad daylight. Only then I realized that the car had left the path of the driveway at the very spot where Sri Swamiji had have been touching my arm, so seriously warning me to be careful on the day of his arrival. Now I was facing the difficult task to get the car removed since it was blocking the pathway. The first two mechanics who looked at it said that is was beyond repair. However, the third one who was specialized in rebuilding accident-cars said: “Don’t worry, mate, I‘ll fix her up, but I can only do it after hours.” He organized a truck with a crane attached and supervised the lifting and transport of the wreck to his workshop. For several months he worked repairing the car in his spare time and to his own amazement the more he worked on it he realized that no parts had to be replaced except the letter ‘A’ for the Vauxhall Insignia on the bonnet, which was missing after the accident. Amazed at this miraculous turn out of his repair efforts, he refused to accept any payment for his work in the end.”I can’t claim this as my doing”, he said. As far as my body was concerned, it was my left arm which turned black and blue two days after the accident and my neck and left shoulder were in permanent pain. A thorough medical examination established that there were no fractures. The doctor ordered rest, physiotherapy, therapeutic massages and acupuncture. For several months I had to lie down on my back as even the easiest chores would exhaust me. The only thing I could do was to lie down and read Sri Swamiji’s books.After I had finished reading them, my condition was still not satisfactory and so I read them over and over again. This incident happened in January 2000 and if it wasn’t for the grace of Sri Swamiji, I would not be here to tell you about it. That I survived contradicts all laws of physics and I am convinced that my survival was only due to Sri Swamiji’s divine intervention. Only then I understood Swami Manasa Datta’s statement on the day of Sri Swamiji’s arrival: “Chaitanya, Sri Swamiji has come here only for you and your daughter”. How naively we think that we are supporting the Guru and His work while in fact it is He who protects and supports us. My neck pain and back pain only vanished completely when I reached the ashram in Mysore for Guru Poornima in August of the following year, as instructed by Sri Swamiji. There I worked in the ashram gardens and decorated their statures of Dattatreya and Sri Mulikeshwara. Over the years I visited all Kshetras of the Datta Peetham throughout India to gather information and take photographs. Most of all I became addicted to take pictures of Sri Swamiji. He taught me so many things externally and silently. Actually, there is no way of reaching Him. There is no point in trying to understand Him. No one can understand the Guru. For me, there is no doubt whatsoever, that Sri Swamiji knows everything. When he talks of things to us, He explains them to us like to a child. It is not theoretical knowledge that Sri Swamiji expounds, but He is actually giving us knowledge through experiences that is coming from the inside and that is what makes it so very precious. Anybody who questions my devotion, or Sri Swamiji’s genuine capacity, leaves me untouched. I have no other way. I simply must follow Him, and I enjoy it. Even if my life’s circumstances change this way or that way, Sri Ganapati Sachchidananda Swamiji, will be the anchor in my life, be it, to keep me on or above the ground. He is always on my mind…Anything else is meaningless. Jaya Guru Datta. Where there is God, there is His devotee; and where there is a devotee, there is God. There is no divergence between the two. Likewise, where there is a disciple, there is his Guru; and where there is Guru, there is bound to be His disciple. Do not get deluded by this duality. Try to realize that this is the same Supreme Reality which pervades the entire Universe. dear Chaitanya, thank you for sharing your experiences with us. I enjoyed reading it and send you warm regards. Thanks you for sharing…..Great inspiration indeed. Appaji’s blessings are there all the time. Jaigurudatta chaitanya, thanks for the posting. This is mind blowing. Every experiences of blessed devotees like you will strengthen the convictions of the ones devotion on Sri Sadguru. We are all waiting for Appaji to visit New Zealand again and bless us. May Appaji bless us all in this. Srigurudatta. Thank you Christian for sharing this amazing and heartfelt story. 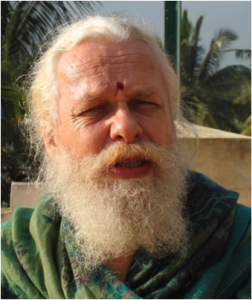 Jaya Guru Datta.